From the "Philadelphia Buildings" biography and Abele's Wikipedia entry. A gifted designer, most of whose recognition came after his death, Julian Abele was the first African-American student to graduate from the University of Pennsylvania's Department of Architecture. Born in Philadelphia, the son of Charles R. and Mary A. Abele. His maternal grandfather was Robert Jones, who in the late eighteenth century founded the city's Lombard Street Central Presbyterian Church. His uncle, Absalom Jones, one of the two men who established the African Methodist Episcopal Church, in 1816, becoming with Richard Allen the first Black Americans to be formally ordained in any American denomination. 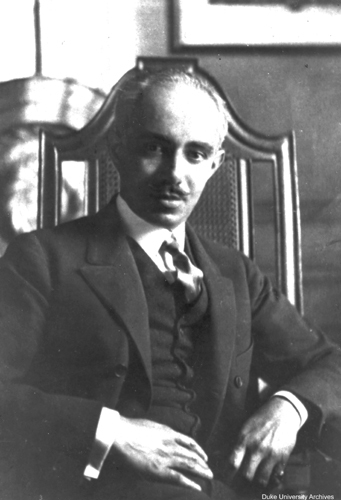 A cousin, Julian Abele Cook, also practiced architecture and went on to design Howard University, and Abele's son, Julian Francis Abele, Jr was an architectural engineer. His temperament and his life defy easy characterization. He was a dedicated francophile, and his wife was French. A devotee of the Philadelphia Symphony Orchestra as well as of the University of Pennsylvania football team, he was reserved and always immaculately dressed. One friend noted that even on vacations at the beach he always wore his suit to the boardwalk. Adele worked in many mediums: watercolor, lithography, etching, pencil; in wood, iron, gold and silver. He designed all his own furniture and made it, even doidng the petit point himself. While he knew many historic styles, he seemed to love Louis XIV French most of all. He attended the Institute for Colored Youth and Brown Preparatory School in Philadelphia (later Cheyney University) before entering the Pennsylvania Museum School of Industrial Art (PMSIA), where he gained his Certificate in Architectural Drawing in 1898, earning the Frederick Graff Prize of $25.00 for work in architectural design, evening class students, 1898. From PMSIA he continued to the University, where he would graduate in 1902. His undergraduate career was distinguished by a number of awards which recognized both his design and rendering abilities, including a first prize for the Pretty Memorial of 1902, the Haverford Memorial Gateway (1901), the Arthur Spayd Brook Memorial (also 1902), and the T-Square Club membership prize. In fact, even as the effort of an undergraduate, Abele's work often appeared in the annual exhibitions held by member societies of the Architectural League of New York. In 1901 he exhibited at the Toronto Architectural Club ("A Loggia in a Park"); in 1901/02 his design for a "bird house" appeared in the T-Square Club annual exhibition; and in 1903, after graduation, his work was included in the Pittsburgh Architectural Club's annual show ("A Metropolitan Cathedral"). In 1902/03 Abele also attended classes in architectural design at the Pennsylvania Academy of the Fine Arts. While still an undergraduate Abele worked for Louis C. Hickman in the evenings, and soon after graduation, his work caught the attention of Horace Trumbauer. Tumbauer hired Abele in 1906, and Abele would work as his chief designer for many years. Immediately after graduation in 1902 Abele went to Spokane, WA, where he designed a house for his sister, Elizabeth Abele Cook, wife of John F. Cook, who had held the post of Collector of Taxes for the District of Columbia for a number of years before accepting a position as Postmaster General in Bonners Ferry, ID (information from Alfred Branam letter to Sandra L. Tatman, 5 December 1981). Abele's career with Horace Trumbauer included responsibility for many of the office's larger country houses (Lynnewood Hall, Elkins Park, PA; Miramar, Newport, RI; James B. Clews Residence, Long Island, NY), the Philadelphia Museum of Art, and buildings at Duke University. Abele designed or contributed to the design of some 400 buildings, including Harvard’s Widener Memorial Library, the Central Branch of the Free Library of Philadelphia, the Shadow Lawn Mansion. His clients included the tobacco magnate James Duke, the financier Jay Gould, and a coterie of the wealthy from Philadelphia Main Line to Newport.